It is no more! Not the WITH Greg Gutfeld part, at least. He has flown the coop. 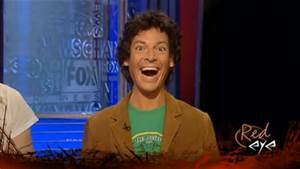 He has been offered his own weekend show, on Fox, and the co-host of The Five will now abandon Red Eye. ISIS has won! It is the end times. So, we’ll still have our Greg … described recently as “winsome” and “satirical” – to which we can add irreverent, cute [like you just want to pinch those cheeks – ON THE FACE! ], unpredictable, spontaneous, naughty AND nice, and witty as hell. Master of the metaphor. For a barbed opinion guy, he can be quite thoughtful and empathetic. Ya just gotta love the man. Congratulations on the new show [as of this writing, unidentified]! With producer Tommy O’Conner moving on with him, what will remain alive in the rubble? We hear that there will be rotating hosts – but who? Back when things were normal, in a Red Eye sort of way, we have had the Leg Chair – where beautiful legs ruled the under table while comedic wit and/or brilliance reigned above. Some of the best legs in that chair have been Lori Rothman, Imogen Lloyd Weber, Remi Spencer, Jedediah Bila, Lauren Sivan, and Donna Feldman, to name a few. Will we still have them? Could we see the return of the almighty Ombudsman presiding over the half-time report [also played by TV’s Andy Levy]? There was one show I recall, where one guy just sat there reading a book for the entire hour – while all hell was going on around him via lively discussion. The Debate Center, the Sponsor segments, cat videos, the Last Story, Vocal Fry News, the disappearing guests, the Lightning Round … “Lightning ROOOOOOOOOUUUUUUUUUUUUUUUUUUUUUUUUUUUUUUUNNNNNNNND!” … again, Sherrod Small. Besides the Leg people mentioned above, an eclectic assortment of musicians, comedians, politicians, military/CIA guys, writers & film stars were brought in to fill out the panel via some uncharted method of rotation … Jesse Joyce, Gavin McInnes, Bonnie McFarlane, Dean Cain, Ann Coulter, Mike Baker, Katherine Timpf, Buck Sexton – he of the Shaggin’ Wagon – The President of Red Eye, Ambassador John Bolton, KT McFarland, Sonnie Johnson, Joe DeVito, the terrified correspondent, Joe Machi, Tom Shillue, Liz MacDonald – so many others, most of them stellar. Will they return? Will YOU? See, we lost a man once, a little over a year ago, a comedic genius by the name of Bill Schulz … erratic and impulsive … also REPULSIVE as Greg’s sidekick. There were many a night where a stream of tears rolled down my cheeks from hysterical laughter as he would spontaneously erupt into a prolonged rant of “phony outrage”. Am I allowed to pee my pants? It was never the same. Very good, but not the same. Bill was an integral part of the shenanigans and I think all Red Eye fans miss him terribly still. Before that, Rachel Marsden had bit the dust. Of course, as far as I can tell, Andy Levy, who has been there from the beginning – 8 years ago – will be back and is a hilarious guy in is own right. Brilliant fella. And then, there is lovely Joanne Nosuchinsky [“I just hear ‘pretty'”], a former Miss New York, who replaced the irreplaceable, Schulz. Bad gig. But, though it is sometimes hard to discern whether she is in over her head or just goofing around, she is poised & can bounce back from any misstep. It’s been fun watching her grow. Her expressions can be priceless. I’ve often thought that a great mime she could be! richfed embraces Greg at 3AM. You were speaking to me were you not? Can you do it? Will you even try? Who among you can step up and be … THIS! 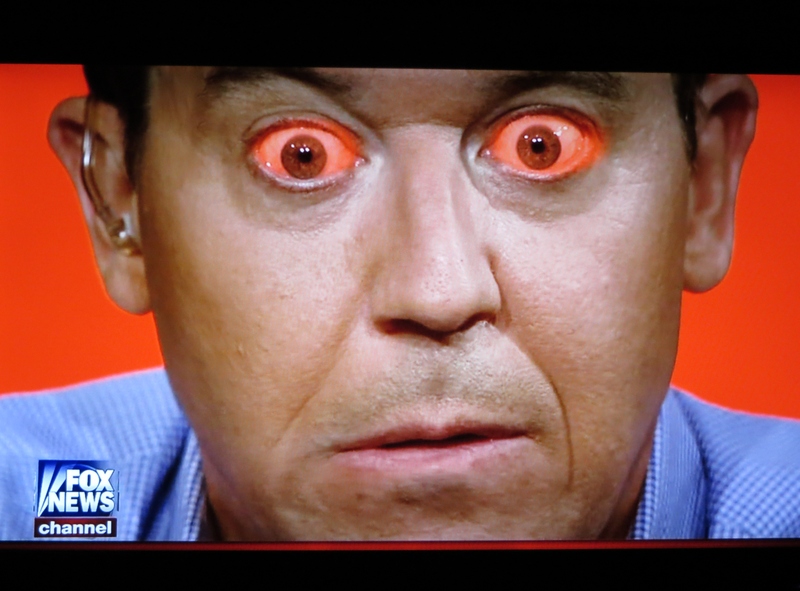 The one & only … the irrepressible … Greg Gutfeld! 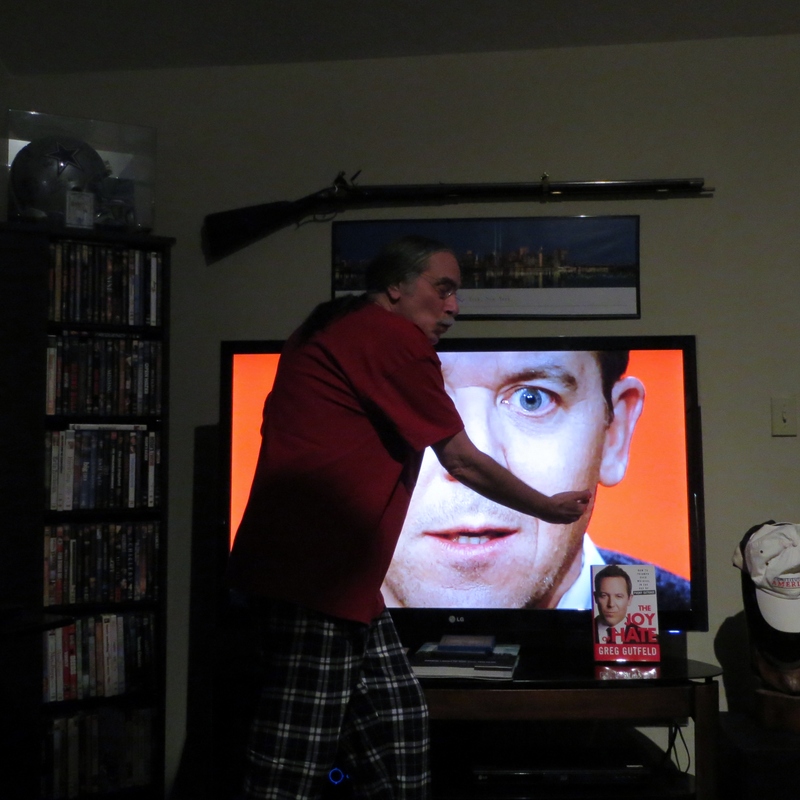 … and now I have to muster up the inner fortitude to watch the last show .. 02/28/2015 … Thank you, Greg Gutfeld … and everybody! Previous Post: A Very Special Night! I started thinking about the new host the minute I read of Greg moving up. Andy is an original and has the seniority, but he seems more comfortable as a panelist than he does when he hosts. JoNo has been very good in the host chair, but doesn’t seem quite ready, is outstanding with her reactions and bits on the panel, and she is the default Leg Chair denizen (the Leg Chair must continue or all of the male viewers [and most of the female] will bolt). So, the new permanent host will need to be someone who is funny (obviously), who has solid political views and a certain fearlessness in expressing them, someone with TV hosting chops including amiability, and, above all, someone who gets RedEye. I, therefore, look to who has guest-hosted in the past, and also those who have subbed for Greg on the Five. Brian Kilmeade has his own gig and Jesse Waters is not a proven host. Lori Rothman and Jeddy Bila have their own gigs and, not trying to be sexist here, I don’t think a woman is right as permanent host–it just doesn’t fit the culture of the show. So, I see three top candidates: Mike Baker, Sherrod Small, and Tom Shillue. I doubt Mike wants the job, and get the idea (from Twitter) that Sherrod and Tom do, so one is checked off. Sherrod is amazing and the show is always better when he’s on it. There is no doubt he gets the show. But I do have reservations, minor as they are, as to his hosting chops. Which leads us to Tom. Tom is a natural when he hosts. He has Greg’s penchant for hilarious self-deprecation (which, different from Greg, has the element of the audience identifying with Tom). Tom, like Greg, has a great face–an everyman’s face. And, there is “A Moment With Tom,” which even has its own theme song. Bottom line is the humor: Sherrod is edgier than Tom, which is both a plus and a minus. Tom has always had Greg’s quality (which Tucker Carlson nailed on Saturday morning) of never patronizing the audience, but rather drawing us in to make us part of the show and in on the jokes. Bottom line: FNC can’t go wrong with Sherrod and he would be great. On the other hand, Tom Shillue is, IMHO, the strongest, and nearly ideal, candidate for the new permanent host of RedEye.